In a large skillet over medium-hi heat, sauté onion & garlic in oil for 2 minutes until soft. Add celery and peppers and sauté 2 minutes. Add dry rice and sauté 2 minutes. Add stock and beans and bring to a boil. Reduce heat, cover and simmer 45 minutes. Remove from heat and let stand at least 10 minutes. Note: You can make this recipe using white rice (I use Uncle Ben's Converted Rice) and reduce the cooking time from 45 to 20 minutes. 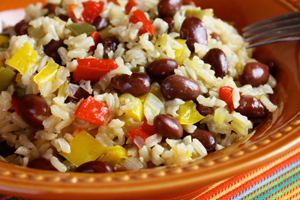 19 Comments on "Red Beans & Brown Rice"
This was a simple weeknight meal that was delicious! I added andoulle sausage which gave plenty ofheat for us! I also simmered the beans & meat with a bay leaf for extra flavor. Great recipe , will make this again! Will you please give the nutritional information for this recipe? I am a diabetic and that information is very important to people like myself. 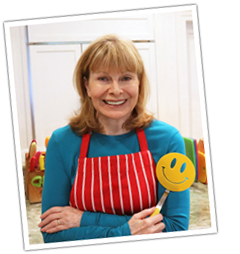 Will you please give the nutritional information for this recipe? I am a diabetic and that information is very important to people like me. I’m sorry, this is just my home cooking and I do not have that information. You could check the cooking time on this rice but as far as I know all long grain brown rice requires 40-45 minutes plus 10 minutes rest. Please check to make sure you follow the recipe exactly, using 3/4 cup of rice and the proper amount of liquid and cooking time. There is no reason for the rice to be hard. not soft and I did not know how to make it absorb more liquid to soften the rice. Any suggestions. Thanks. Brown rice is definitely more chewy than white but it should not be hard and pebble like. I just made this dish last week and I always use long grain brown rice. What kind of rice did you use? This recipe is the best! Thank you. My whole family loves it and it is very healthy! Campbell’s No Salt Added Beef, Chicken, Vegetable Stock. Available at most groceries. Some days, when I feel like cooking, I load my oven with rice (all types of brown or white, also wild), different types of beans, wheat, barley, or any other grain. Basically, 1 cup dry to 2 cups boiling liquid plus any salt you may wish to use. Rice takes 1 hour in a 350 F. degree oven, other grains may take more and require additional liquid (hot). COOK COVERED. When done, let cool and use right away or freeze in freezer bags or containers for future use. I keep these cooked grains for any dish I want to prepare when I don’t want to do much cooking. It really pays in time-saving and these items can last a long time without losing flavor. I would like to use not pre cooked beans. Can I just replace the canned beans with the raw beans or would I need to cook them separately? You would cook the beans separately. They need more liquid than this recipe provides and also they would need more time to cook than this recipe. I would prefer it if most recipes would use “made from scratch” ingredients such as beans!